There is a custom in the music world, especially among singer-songwriters, that once a song is recorded, that’s it, and though it may change in performance, the original recording is considered the definitive version. The general exception is live albums, but for the most part, once a song is recorded by its songwriter, he or she does not revisit it on record. But there have been some exceptions. Over the last couple of decades prominent singer-songwriters Joni Mitchell, Sting and Peter Gabriel have made albums of orchestral versions of their songs. And the always prolific Van Morrison has recorded different versions of a number of his songs over the years. This week, we have a new recording by one of the most prominent of the singer-songwriters to emerge from the 1960s, Paul Simon, who has created an entire album of distinctive remakes of his songs, mostly lesser known ones, than span most of his post-Garfunkel solo career. It’s called In the Blue Light and it turns out to one of his most musically interesting releases, that brings him together with a number of creative jazz musicians like Wynton Marsalis and Bill Frisell and the eclectic chamber ensemble yMusic. Simon writes in the liner notes “This album consists of songs that I thought were almost right, or were odd enough as to be overlooked the first time around.” He adds that he “[re-did] arrangements, harmonic structures and lyrics that didn’t make their meaning clear.” In the process, it brings into focus some of Simon’s more under-the-radar writing. Sometimes the remake will bring a different sonic texture to the songs, and sometimes the arrangement goes in a completely different direction from the original, with for example the pieces with the chamber ensemble of strings and woodwinds. There are also songs that are given the treatment of a jazz ballad with appropriate instrumentation, and one piece, with the help of Wynton Marsalis, gets a New Orleans brass band sound. Among other notable players are the outstanding young jazz pianist Sullivan Fortner, who has gained prominence from his work with Grammy winning vocalist Ceclie McLorin Salvant, sax veteran Joe Lovano, bassist John Patitucci, and a reunion with drummer Steve Gadd, who created the iconic march beat in Simon’s Fifty Ways to Leave Your Lover. The album also features some of the sonic quirks that marked his last album Stranger to Stranger. 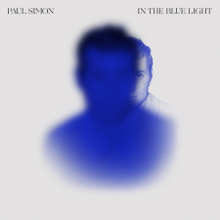 Paul Simon’s new 14th studio album In the Blue Light has no new songs on it, but it ends up being one of his most distinctive and I would say memorable. He picks 10 compositions from a cross section of his career from 1973 to 2011 album releases, and collaborates with some very creative musicians, from jazz players Wynton Marsalis and Sulliver Fortner to the eclectic neo-classical chamber ensemble yMusic to revisit songs that are not on Simon’s greatest hit list, but for the most part are given a very different spin, and perhaps have new life breathed into them. Our grade for sound quality is a “B” and we’re being generous. Simon worked again with Roy Halee, his co-producer and engineer since the 1960s, who seems be trying to be hip by using some of the sonic cliches of contemporary pop, including too much volume compression, robbing the recording of the dynamic range that is embodied in the excellent performances, and often adding an annoying echo and delay effect to Simon’s vocals. At age 76, Paul Simon’s vocal is impressive as it is. As this album was being released, Simon was wrapping up what he called his farewell tour, retiring from the concert circuit. Perhaps Simon considers this album a kind of retrospective or maybe a sort of valedictory, by trying to highlight songs he thought might have been overlooked. In any case, the album is an outstanding, creative and very classy one, and hardly a greatest hits remake record. Whether you are a devoted fan of Paul Simon or not, In the Blue Light is an impressive recording by one of America’s great singer-songwriters.